The writings of Harold Garfinkel have had a major impact on the social sciences and linguistics. 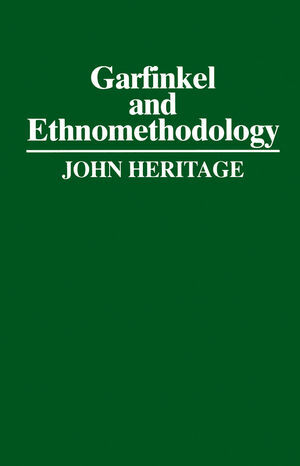 This book offers a systematic and innovative analysis of his theories and of the ethnomethodological movement which he has inspired. It is the only full-length study focused on the writings of Harold Garfinkel and will be essential reading for all those concerned with understanding and evaluating one of the most radically original social scientists of recent times. John Heritage is Professor of Sociology at UCLA. He is the coeditor (with J.M. Atkinson) of Structures of Social Action: Studies in Conversation Analysis and is currently researching on televised political communication. 4 The Morality of Cognition. 5 Actions, Rules and Contexts. 9 Epilogue: An Uncompleted Quest.